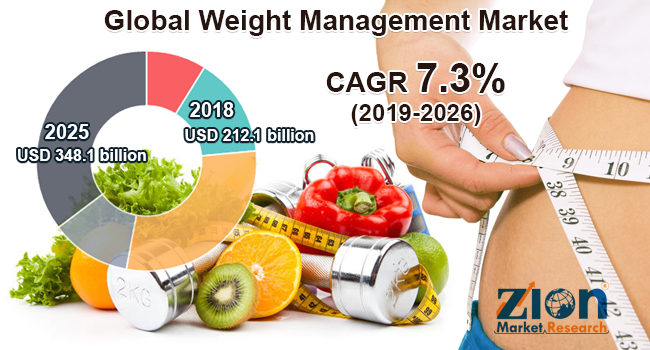 Global weight management market expected to generate around USD 348.1 billion by 2025, at a CAGR of around 7.3% between 2019 and 2025. The rapidly rising inclination toward junk food, less preference for physical activities, and the growing fast food industry are resulting in a sedentary and unhealthy lifestyle, which leads to weight gain. The report covers a forecast and an analysis of the weight management market on a global and regional level. The study provides historical data for 2017 and 2018 along with a forecast from 2019 to 2025 based on revenue (USD Billion). The study includes drivers and restraints of the weight management market along with the impact they have on the demand over the forecast period. Additionally, the report includes the study of opportunities available in the weight management market on a global level. In order to give the users of this report a comprehensive view of the weight management market, we have included a competitive landscape and an analysis of Porter’s Five Forces model for the market. The study encompasses a market attractiveness analysis, wherein all the segments are benchmarked based on their market size, growth rate, and general attractiveness. The study provides a decisive view of the weight management market by segmenting the market based on diet, equipment, service, and region. All the segments have been analyzed based on present and future trends and the market is estimated from 2019 to 2025. Based on a diet, the market is segmented into meals, beverages, and supplements. By equipment, the market includes fitness equipment and surgical equipment. The surgical equipment market is bifurcated into minimally invasive/bariatric equipment and non-invasive surgical equipment. The fitness equipment segment is further classified into cardiovascular training equipment, strength training equipment, and others. By service, the market is segmented into slimming centers, fitness centers, consultation services, and online weight loss services. The regional segment includes the current and forecast demand for North America, Europe, Asia Pacific, Latin America, and the Middle East and Africa with its further classification into major countries including the U.S., Germany, France, UK, China, Japan, India, and Brazil. Some key players of the global weight management market are Herbalife International, Inc., NutriSystem, Inc., Weight Watchers International, Inc., eDiets.com, Brunswick Corporation, Ethicon US, LLC, Ethicon Endo-Surgery, Inc., and Gold's Gym.